Forums » Classic Motorsports » 1960s Alfa parts availability and cost? 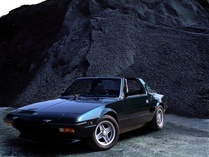 I have a hankering for old Lancias but have been told that parts costs are on a par with exotics such as Ferraris. What's the landscape look like for something like an early 60s Giulietta Berlina? My past experience has been with Volvos and Fords, with a smattering of Fiat thrown in. I share your appreciation for old Lancias. Pre-Fiat Lancias are probably my favorite classics. The crazy engineering on even the most pedestrian models is amazing. Now on to that Berlina. I freaking LOVE that. The 750 series Alfas are nice driving cars. Eager little alloy twin cam backed by a smooth five speed must have felt like a space ship compared to the American offerings in that market segment when new. I'm guessing that still has a 1.3. It is a fine little motor. The transmissions were excellent for the time, but not special compared to a modern manual. I have rebuilt a dozen of them, all with bad #2 synchros. These transmissions use an expanding ring type synchro, not a tapered brass sleeve. I have only ever seen this type in Ferrari and the Fiat 850 gearbox. They do not take kindly to being lubricated with Redline MTL. I always try to use a non synthetic that matches the original spec but the Redline 75-90NS works well. Being a berlina I doubt it has the triple leading brake drums, which isn't a bad thing in my mind. For mechanical parts I have never had an issue finding them. We tend to order from Classic Alfa in the UK. They tend to arrive just as fast as the USA based vendors and have a better selection. I do not know about the sedan specific trim bits. We deal with the coupes and convertibles a lot. Would you be preserving it or upgrading? Wow, Giulietta Berlinas are pretty rare in the US. We mostly go Spiders and Sprints, but they did sell in pretty healthy numbers in Europe. Not sure if a '62 got a 5 speed, but I'm sure it's a 101 car instead of a 750 car, so you can direct swap in a 5 speed. Treat them nice, and they last really well- I have a direct descendent in my GTV, and being careful with both the 1-2 AND the engagement into 1 from rest really helps make the syncros last a long time. I wish I ever drove one of my Giuliettas, but neither were ever in a state close to driving when I owned them. Everyone raves about how nice they drive- including the huge drum brakes. The engine is really nice- even with very little power, that 1300 sings. Very easy to rebuild, but I doubt you would have to. Other locations to get parts- Centerline Alfa- https://centerlinealfa.com/ (who took over most of International's stuff), Re-Originals- http://reoriginals.com/, and Wolfe Steel- http://www.alfaparts.net/ have always been good to me. Being a Berlina, you may have to find metal and trim from Europe, though. The mechanical can easily be source in the US. And get to know your local Alfa mechanic if you get that car, they are invaluable. Thank you for the information. I typically hack up my cars, but this one is too nice and original to suffer such indignity. I'd keep changes within the realm of tasteful, reversible upgrades. Fortunately my shop is about 2 blocks from a top Alfa mechanic (Oliveria Engineering). The best tasteful, reversible upgrades- 1600 motor (they work really well even with one carb, so it still looks goo), 5 speed, disk front brakes. The first two- you really have to look closely to even tell there's a change, the latter is slightly more obvious. An upgrade to a 2000 from a more modern spider is a little harder, but has been done more than once. A 1750 may be an easier swap since it is easier to deal with a mechanical instead of hydraulic clutch. There are a host of spring and shock "upgrades"- so you may have to research what you want. I got mine from Alfaholics in the UK when I did it.